Everything You Need to Know About Flying Monks . . .
A Buddhist monastery high in the mountains of Taiwan, carved into the hillside. A narrow path was all that separated me from the crashing ocean waves far below. Had I walked too close to the edge and lost my balance, there would have been nothing to catch me. I wondered if that was part of the point. The teacher was charismatic, compassionate, and controversial, and as magnificently dramatic as the monastery built in his name. His story of having been a child soldier in Burma is often part of his introduction. When he finally reached Taiwan after a long series of adventures, he shaved his head and etched the Heart Sutra into his skin. One of the nuns told me that his tattoo had spelling mistakes—a detail that makes him all the more endearing. One day, the Master invited me for a walk. He brought me to a small rock cave and explained that he once spent a year meditating in that very space. It was the reason he chose to build his monastery here—the heart of his world. Then he told me something else: that he did not eat or drink for most of the year that he had lived in the cave. He had only some pills, made from the nectar of a mysterious flower, but otherwise did not consume anything (with the exception of a few drops of water) for an entire year. As you might expect, my response was to stare at him in disbelief. I eventually regained my composure and asked him to repeat his story to be sure I had understood. So he repeated his story, with the same incomprehensible information as before. I just kept staring at him, which appeared to entertain him. He laughed gently, patted my shoulder, and told me it was time to go. What was I supposed to do with that story? Knowing the Master as I do, I’m quite certain he’s not a liar, and yet . . . was I actually supposed to believe him? The setting certainly gave the account more potency; had he told me that story in more familiar territory, what would I have thought? I still don’t know the answer to that question. I eventually went back to see him to ask again, but he was not particularly forthcoming. I think he enjoyed my consternation too much and decided to leave me in it. All he did was remind me that there were stories of the Buddha doing such things. “But you aren’t the Buddha!” was my spontaneous response. He smiled enigmatically and walked away. I can appreciate the role of the “mysterious Buddhist teacher.” It is a tradition that Buddhist teachers have long enjoyed as they play games with other people’s questions in the hopes of unraveling some of the knots in our heads. Not everything needs to be explained, nor are there concrete answers to every question. But this wasn’t merely a game to him, even if he was having fun in the process. The Master insisted on the facts of his story and his devotees repeated them to me emphatically. He may have been toying with me, but he also meant what he said and he was waiting for me to engage. But how? I kept searching through the drawers of my mind for the tools I needed to understand his assertions. I didn’t think he was lying; yet I could not believe he was telling the truth. Was there something in between that I couldn’t see? I stopped and stared at her. “Seriously?” was the most academic response I could muster. And then she did what the Master did before: she smiled enigmatically and moved the conversation on to something else. Clearly, the mysterious Buddhist teacher role is alive and strong. That is one thing I’ve learned from these interactions. But playfulness aside, I suspect there is more at stake than I’m able to see. I don’t believe these teachers are liars, but I don’t really believe they are telling the truth. I am therefore left with the possibility that I am missing the required tools from my intellectual inventory. These teachers are also pointing me toward a long tradition of magical storytelling, most of it much more dramatic than an extended fast. Flying monks and levitating masters are a familiar part of this terrain. Some are even said to have been able to slip through keyholes, while others could see one’s past lives. 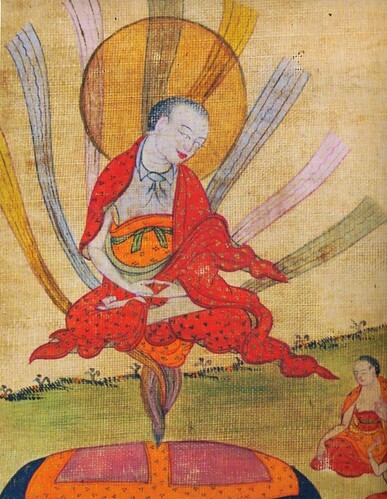 Magical illusions are generated for the benefit of the viewer, and countless teachers are said to have been able to disappear into a rainbow cloud when required. 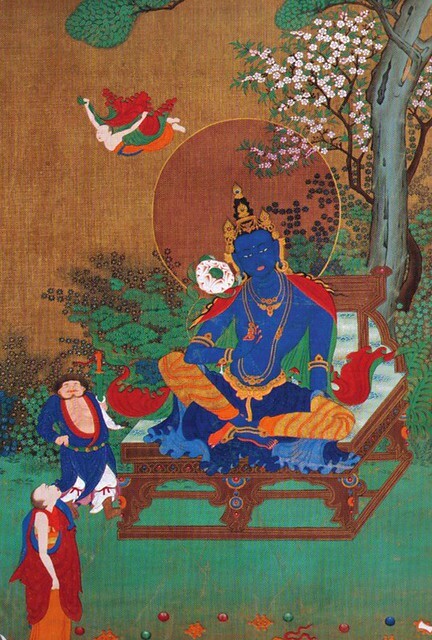 The Buddha, during the miracle of Sravasti, gave a teaching from a jeweled walkway in the sky while his body morphed into fire and water. There is no dearth of material when it comes to superhuman feats in the Buddhist tradition. Sitting in a cave without food is tame by comparison. Nevertheless, these stories continue to defy my capacity to understand. I don’t want to dismiss the magical and demand materialism from the tradition. I am quite certain I will be missing all the good stuff if I do. But I’m not capable of adopting these stories either. And there are so many of them.